Please see below for our holiday opening hours. If a certain date is not listed, then we are open for normal business hours. Like Batman, do you silence early Christmas mentions? 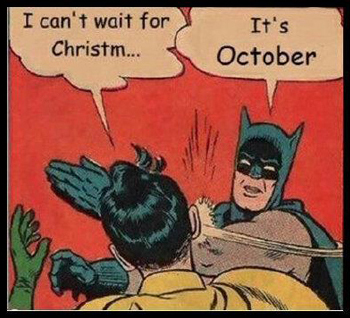 Or, like Robin, can’t you wait? Batmen look away now. Robins, what the boy marvel’s trying to say is that he can’t wait for Christmas parties at Canteen. As you can’t either, here’s what you need to do. 3. First you’ll want to find out more about the Prosecco, bar snacks like pork scratchings and three courses that make up the great value Christmas Canteen menu, full mouthwatering details of which you’ll find on the homepage. To book, call 0845 686 1122 for Spitalfields, Canary Wharf, Baker Street or Royal Festival Hall, and 020 7836 8368 for Covent Garden.